As far as Ayurveda goes, Tulsi or the holy basil is known as the queen of herbs. It is considered to be a wonder herb that offers a number of health benefits. It is actually the Sanskrit name of Basil which apart from being connected to holiness, is used various remedies to treat a number of health disorders since ages. While relieving us of stress has always been considered to be one of the primary benefits of tulsi, modern research has shown this wonder herb to have many more amazing benefits. Being a wonderful stress reliever to boosting immunity, heart health, kidney conditions; there are a number of benefits of tulsi tea. And today, I am going to talk about the 15 incredible benefits of tulsi tea. Apart from talking about the benefits of tulsi tea (tea made of holy basil leaves), I will also explain the process of making tulsi tea so that you can make tulsi tea at home and drink it to get all these benefits that it offers. 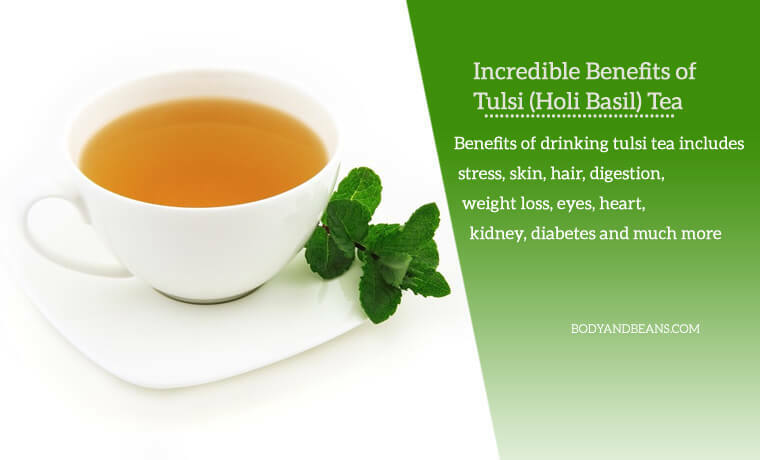 There are several ways to use tulsi for our benefits, but I personally prefer drinking tulsi tea as it is the simplest and certainly the most efficient way to treat various health and beauty issues. It is a natural remedy and is very simple and cost effective. I myself drink tulsi tea often and I think I am in a better space right now. So, if you also want to know about the magical benefits of tulsi tea, then here’s the post you should read till the end. With increasing number of various health and beauty issues, we do need more of natural products that can help us treat some of these common disorders and tulsi tea is definitely something to look forward to. Tulsi is a powerhouse of nutrients with various vitamins, minerals and antioxidants present in it. It can indeed solve many of your health issues starting from calming you down to acting as the perfect anti-inflammatory agent to relieving you off the pains. You just have to make efforts to drink tulsi tea frequently and enjoy the benefits of tulsi tea for common disorders. Once, majorly found in India, tulsi tea is now popular in other parts of the world, thanks to its therapeutic properties. It is something which is quite pleasurable to taste and you can ingest it cold or hot as per your wish. No matter how and in which form you consume tulsi, it’s going to benefits you immensely. I am sure you are curious to learn about the various benefits of tulsi tea, so without any delay, let’s check the incredible benefits of tulsi tea and how to make it at home. Most of us have the habit of drinking tea everyday but how about replacing the regular tea with the beneficial tulsi tea? Tulsi tea is made by brewing the tulsi leaves in water and it is certainly one of the best ways in reaping the maximum benefits of tulsi tea. This is because, tulsi plant which is of Ocimum genius contains ursolic acid, eugenol, carvacrol along with other properties like luteolin, apigenin, vicenin, orientin and other flavonoids, all of which are extremely beneficial for your health. Terpenes like limatrol, linalool, caryophyllene, compounds like estragol, rosmarinic propanoic acid, cirsimaritin, apegenin, various saponins, tannins, triterpenoids, are all present in tulsi. Hence, when you brew the leaves, the nutrients get drawn into the water which makes the tea all the more nutritious and healthy. Tulsi is good for digestion because it stimulates gastric juice production which enables food to get digested quickly. It is also anti-ulcerogenic in nature which prevents the secretion of undesirable pepsin and lipid peroxidation and lead to the production of mucous cells and gastric mucin in defense. Now, because it leads to fast digestion and assimilation of the ingested proteins and carbohydrates, the fats and the lipids are broken down slowly which in turn reduce hunger pangs and keeps your tummy full for long. 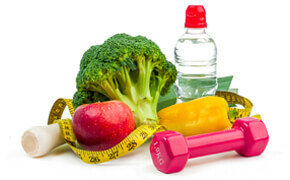 And, this activity enables effective weight loss. So, drinking tulsi tea gives the perfect boost to your digestive system as well as helps you lose weight. One of the other surprising benefits of tulsi tea is that it protects from all types of cellular damage caused by toxins. This is important to note because we are exposed to pollution containing lots of chemicals and harmful toxins on a daily basis. These harmful substances are collectively called free radicals which are thrown out of the body for good. But, sometimes if there is too much of these toxins, our body cannot keep up with it causing lots of health issues, one of the life-threatening ones being cancer. But, lucky for us, tulsi tea contains various healthy antioxidants that can protect us from the negative impacts of the toxins in our body. Slowly with age, the condition of our skin declines. Its ability to fight against the free radicals is reduced and as a result various age-related skin issues start appearing. Sometimes, the skin issues start from a young age as well. But, if you drink tulsi tea regularly, then you may be able to keep your skin beautiful for long. This is because of the presence of polyphenols and antioxidants that helps your skin fight the free radicals and delays the signs of aging. Drinking tulsi tea is seriously beneficial for your skin and hence you should consider drinking it regularly. Drinking tulsi tea is not just good for your skin but it has several hair benefits as well. Besides improving the overall texture of your hair, drinking the nutrition-rich tulsi tea also helps in reducing the problem of itchy scalp. It also lessens hair fall and leads to growth of new hair follicles. And, the antimicrobial nature of tulsi tea also prevents occurrence of scalp infections. All in all, drinking tulsi tea on regular basis can help you fight many of the hair issues including hair fall and itchy scalp. One of the primary benefits of tulsi tea is that it helps you immensely in reducing the stress. Living a stress free life is essential for healthy living considering the immense amount of stress we undergo to keep up with the rat race and several other drastic unfavorable changes occurring in our surroundings. The main reason behind tulsi tea being so beneficial in relieving us of stress is due to the presence of flavonoids like eugenol in tulsi leaves. Flavonoids are considered as a perfect antidepressant and it aids your body in calming you down and stimulating the production of neurotransmitters which are further helpful in coping with stress and anxiety. Studies have already proved its potentiality in relieving you off both physical and brain stress. Experiments showed participants who were involved in rigorous exercises like swimming did have sufficient reduction in levels of mental and physical stress. Tulsi is believed to be an herb for all the good reasons and hence you must add tulsi tea in your diet and benefit from it. Something that helps so much in coping up with stress is in all probability good for your brain in general and tulsi tea is no exception. It sharpens your memory and is very effective in treating age related neurogenerative disorders like Alzheimer’s. Moreover, tulsi tea also regulates your circadian rhythm which helps you maintain proper sleep cycles. It is thus very effective for people suffering from insomnia. In other words, when you are free of stress and your brain gets enough time to rest after a day’s hectic work, it is definitely good and will lead to the improvement of your cognitive abilities. You need to start drinking tulsi tea if you are a victim of weak heart. This is mainly because tulsi contains ursolic acid and other derivatives which has cardioprotective characteristics. Also, the phytochemicals that you find in tulsi tea helps in the reduction of the free radicals present in the blood which in turn helps in preventing the derivatives of cholesterol to accumulate on the walls of the blood vessels. This promotes hassle free circulation which keeps the blood pressure levels in control. Tulsi tea also contains calcium and potassium which further gives protection to your heart from myocardial infarction, chemicals, oxidative stress and ischemic attacks. In 1996, there was an experiment done to check whether tulsi can be effective against Diabetes and it was led by Dr. Pragya Agarwal of Azad University of Agriculture and Technology in India. The results were published in “International Journal of Clinical Pharmacology and Therapeutics” and it showed that participants who ingested tulsi on a daily basis had a nearly 18% reduction in the levels of blood sugar which eventually led to the conclusion that tulsi leaves were anti-diabetic in nature. Tulsi leaves have the ability to regulate blood sugar levels and stimulate the secretion of insulin from the pancreas and increase the sensitivity of insulin in the surrounding tissues. Thus, if you brew your tea with some tulsi leaves regularly, it will improve the availability of the insulin in your plasma which will enable blood glucose to be rapidly taken up and metabolized. One of the other incredible benefits of tulsi tea is that if you drink it frequently, then it will keep you safe from all kinds of infections. The primary factor behind this is its antimicrobial nature which is already proved by science. It is actually effective against most kinds of bacteria, fungus, virus and other pathogens, thanks to the presence of high levels of terpenoids, flavonoids and phenolic acids like linoleic acid. Therefore, we can safely conclude that drinking tulsi tea can cure all bacterial, fungal and viral infections occurring in your digestive, respiratory, dermal, dental, nervous and urinary systems and give you fast relief. If you want an all in all protection of your kidneys then you must start drinking tulsi tea on a daily basis. Tulsi leaves are anti-inflammatory and anti-microbial and hence they fight to treat kidney infections. Not only that, tulsi tea is also very potent in helping you prevent the occurrence of kidney stones. Tulsi is a detoxifier and is mildly diuretic which helps to reduce the level of uric acid (which is the main factor behind the occurrence of kidney stones) in blood and also helps cleanse the kidneys through urination. One of the other benefits of tulsi tea is that it can help you treat many of the respiratory issues such as asthma, pneumonia, bronchitis, common cold and cough etc. It is mainly due to the richness of anti-inflammatory phytochemicals like camphene, eugenol, cineole that helps tulsi tea act like a great expectorant. It helps in releasing the mucus and phlegm which gets generated due to the microbial infection. Hence, next time you catch cold, make sure you are drinking hot or lukewarm tulsi tea on a regular basis as that will not allow the common cold from taking the shape of a complex respiratory disease and ease the problem at an early stage. The holy basil is good in healing your wounds rapidly. It is due to the fact that flavonoids and terpenes in tulsi leaves work as antioxidants and stimulates the antioxidant enzymes like superoxide dismutase (SOD) and catalase in your wounded portions. As per studies, the action of these enzymes on your deep wounds helps in accelerating the healing process. Tropical application of the tulsi leaves is best for external problems like the wounds or cuts on your skin. So, besides drinking tulsi tea, you can also apply a paste of tulsi leaves on your wounds as that will lead to the contraction of the wound, drying off and then finally peeling off very fast. Tulsi tea is very beneficial for good eyesight and the reason behind it is its ability to fight various pathogens. Now, most of the eye inflammations are caused by the virus, bacteria and fungi but thanks to the anti-inflammatory nature of the tulsi leaves, it helps fight the germs and soothes the eye swellings. Tulsi tea also has healing and analgesic properties which is very beneficial in curing ocular injuries caused by chemicals, plant saps, sharp splinters or other eye problems like conjunctivitis and glaucoma. You can maintain a good oral hygiene with tulsi leaves. Many types of toothpaste contain tulsi in them because it helps fight germs as well as cure many of the dental problems. Since tulsi is antimicrobial in nature, it also prevents occurrence of any kind of dental infections or cavities. In addition, tulsi tea if swished within your mouth can also benefit you by eliminating the problem of bad breath. With so many incredible health benefits of tulsi tea, there is no doubt that drinking it regularly will help you boost your immune system in general. It improves your body defense mechanisms and saves you from various infections and other diseases including cold and flu. Tulsi leaves are also anti-inflammatory in nature, which helps in treating all kinds of swellings in different parts of the body. Having a strong immune system is the basic to healthy living and if by drinking tulsi tea, we can get it then I think it is completely worth it. How to make tulsi tea easily at home? Now that you have learned about the various benefits of tulsi tea and how to make tasty tulsi tea easily at home, it’s time to discover if there can be any side effects of drinking tulsi tea regularly. It is not that, each one of you will get affected, but as I keep telling that the physiological functioning is not same for each one of us and hence it is always better if you know about the side effects from before to avoid them. Although there is not much written proof but tulsi tea is often said to cause infertility problems. However, it is believed to affect men more than women. And, as far as pregnant women or breastfeeding women are concerned, I would recommend you to drink it only after consulting your doctor. Tulsi tea is proved to reduce hypertension and for that, it can lead to the modification of the physical properties and composition of the blood, one of which is definitely its thickness. In other words, it may lead to the thinning of your blood. For that, in case any of you has undergone a surgery recently, it is best if you stop drinking tulsi tea otherwise it can delay the process of blood clotting which may turn lethal. Natural ingredients have always been great in saving man from various health and beauty troubles. There are various natural ayurvedic and herbal remedies that has been in use since ages, one of them is definitely the usage of the magical herb tulsi. The leaves of the tulsi plant have medicinal properties and can be of huge help to mankind if known how to use it. While tropical application of the tulsi leaves is mostly beneficial in matters of external usage, drinking tulsi tea actually covers and cures a vast range of health and beauty issues from inside. Here, in my today’s article, I have already talked about 15 of the incredible benefits of tulsi tea which are extremely important to know. See, in the world of science, people mainly depend on expensive medicines to cure even the common health issues. But many of these medicines have side effects which may lead to other complications. But, with natural remedies like for example tulsi tea, it is natural and safe and is beneficial for a majority of people. However, I did mention two side effects which some of you may experience after drinking this tea but that is only because our physiological conditions are different from one another so at times, our body does react differently. If, by chance, you are unlucky and that the tulsi tea does not suit you, I would request you to stop drinking it or consult a good doctor before drinking it further. Cure in the means of natural ingredients is always safe and cost effective but you know what, in the end you must also not forget to lead a disciplined life. In other words, if you use lot of natural remedies to treat all your health and beauty problems but maintain indiscipline in your day to day life, then that is simply not going to work. You need to eat right in adequate amounts, sleep well, get rid of the unhealthy practices as well as use the natural remedies like tulsi tea for all round protection. To be specific, you have to allow the natural ingredients to give you maximum benefits by supporting it with a disciplined lifestyle. So, have you yet tried out the magical tulsi leaves? Well, if you haven’t, then it is time that you try it and get the benefits of drinking tulsi tea. But if you are already drinking tulsi tea regularly, then I would like to know about the various benefits of drinking tulsi tea. Until then, stay healthy and make the magical tulsi tea a part of your life.